​You’ve had enough, stitching with an awl. Your fingers sore and your stitches uneven. Some of your stitches look forced, a clear indication you couldn’t reach every crevice of the shoe. Your struggle to get through the fabric is evident. Your sewn shoes look like they belong to one-side-legged feet. Frustrated, you scratch your head and stare once more at the disaster that is your work. You need a workable plan. You realize an upgrade to a sewing machine is prudent to produce good quality, comfortable shoes; shoes that will give their wearer service that is worth their while. If you’re looking to buy the best shoe sewing machine to sew your shoes, just right, then you’re in the right place. 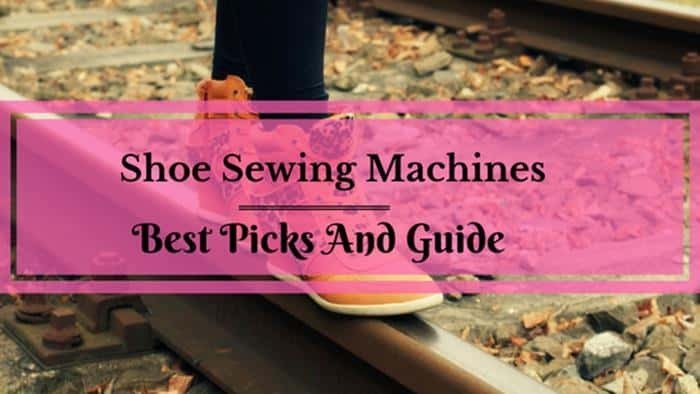 By the time you’re done reading through this guide, you ‘ll confidently purchase your shoe stitching machine. We’ll look at two of the best, affordable shoe sewing machines that you will find online today. 3 Which one should you pick? 4 What factors should you consider when choosing a shoe sewing machine? 5 What fabrics does it sew? 6 Can I adjust the stitch length? 7 Can I quickly get replacement needles for it? 8 Will my machine let me sew in any direction? 10 Is the machine Steady? 11 Is it easy to set up? 12 Does it have an ergonomically friendly height? It's a fantastic old technology that has stood the test of time and still working great in our era. Weighing 24.2lb, the sturdy Fisters sewing machine is easy to set up and can comfortably sew through layers of leather fabric. Other fabrics you can use with it are nylon and cotton wire. Consider using it if you make sneakers, high heel even raincoats, handbags and other leather products. Fisters features a walking foot that adjusts and turns to any direction, and an arm to allow you to sew in-depth corners of shoes. It uses standard needles as you would with a sewing machine. It's Greasy. However, it's not rusty. Click here to buy the Fisters Shoe machine from Amazon. Eco-worthy weighs 25.9lb, is also easy to set up and requires you to do this right for it to work reliably. You can stitch through leather fabrics with it, although you may need to replace its needles with heavy-duty ones when sewing through thick layers. Like Fisters shoe repair machine it also comes with a walking foot and lets you sew in any direction to reach difficult inside parts of the shoes. To keep your work intact, check whether you need to smoothen its edges, especially the area that comes into contact with the leather. Eco worthy is easy to set up and use. It comes with a walking foot. If you are going to sew thick leather, then you have to replace its thin needle with the leather needle. Click here to buy the Eco worthy Shoe machine from Amazon. Both machines are sturdy and easy to set up. They both feature a walking foot that comes in handy and will stitch through several layers of leather. However, between the two, if I were you, I would pick the Fister's sewing machine because it has more reviews online than its competitor. What factors should you consider when choosing a shoe sewing machine? Let’s look at essential factors to consider when you go out in search of a suitable machine. See, the beauty of reviews is that you get to have a virtual look and feel of your sewing machine before spending your money on it. Let’s delve deep and look at the factors you should check off before pressing the ‘Buy Now’ button. What fabrics does it sew? There are the plethora of fabrics for cobbling and being the creative person; you are, you cannot limit yourself to just a few. Consider a machine that easily sews through most of these materials to enjoy its full benefits. Can I adjust the stitch length? To get the right tension, you need to adjust the stitch length according to the thickness of your fabric. You would be able to work with both thin and thick fabric only if your machine is apt for it. So, ensure your choice comes with the adjustable stitch length so that you can work with all fabrics. Can I quickly get replacement needles for it? For convenience’s sake, the right machine will not make you hunt for near-extinct needles to use it. You and I know that this would easily discourage you into letting that disappointing machine sit back and gather moss while you seek alternatives. Instead, find a sewing machine that uses needles you can easily replace like regular needles. Will my machine let me sew in any direction? Here is a feature you’ll need to look out for if you appreciate consistency in your stitching even on difficult to reach areas. Look out for a machine that features a foot that can turn and sew in all directions, enabling you to stitch up your shoe without having to turn your fabric. No matter how good an item is, how long it lasts remains one of the most important factors to consider. A good shoe machine needs to take the pressure of stitching through tough fabrics, and handling knocks that come with the making of a shoe. Through this, it needs to hold strong without giving in to breakages and bends. Look for shoe machine that's made of durable material like metal. To work effectively, you need to have a cobbler sewing machine that stands steadily, rather than be shaky since it would have to go through extensive aggression and manipulation. Check that it weighs heavy enough to hold firmly and light enough for you to move around, should you need to. You’ll agree with me that a sewing machine is easy to set up, encourages you to use it. A complex sewing machine can get you thinking and be deciding whether you want to go through all the trouble. Especially if all you want to do is repairing a small tear. Think about it. How many times have you reconsidered buying something because it involves too much work? Many I suppose? In the same way, get the best cobbler that gives you a quick-set-up experience to enjoy the time spent working on it. Does it have an ergonomically friendly height? For a shoe making sewing machine to be ergonomic depends on your preferred position while sewing. Some like to place it on a tabletop and sitting on a chair, while others would rather sit on a short stool and work the machine while standing it on the ground. Depending on your preference, ensure your shoe stitching machine gives you a comfortable height to work with. You can dump your awl since you don't need to pierce the fabric with it. With a functional shoe machine, you can easily switch to a shoe stitching machinery and get the job done in less time. Through this review, you have gained insight on what a sewing machine for shoes should offer you. Knowing what to look for will now save you time, and from here you can easily shop for the best shoe sewing machine, your money can buy. Related: More information regarding the best sewing machines for leather.